Starting in 1999, Claude Lanzmann made several films that could be considered satellites of SHOAH, comprised of interviews conducted in the 1970s that didn't make it into the final, monumental work. In the last years of the late director's life, he decided to devote a film to four women from four different areas of Eastern Europe with four different destinies, each finding herself improbably alive after war's end: Ruth Elias from Ostravia, Czechoslovakia; Paula Biren from Lodz, Poland; Ada Lichtman from further south in Krakow; and Hannah Marton from Cluj, or Kolozsva'r, in Transylvania. Survivors of unimaginable Nazi horrors during the Holocaust, they tell their individual stories and become crucial witnesses to the barbarism they experienced. Each possesses a vivid intelligence and a commitment to candor that make their accounts of what they suffered through both searing and unforgettable. 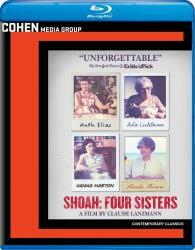 Shoah: Four Sisters now arrives on the screen to remind audiences of the immense courage it took for these witnesses to return to their past as they share their deeply moving personal tragedies. The frankness of their words, their intensely scrutinized faces, and their bravery as they revisit unimaginable experiences will make them lasting presences in the moral universe of younger generations. "What they have in common," wrote Lanzmann," apart from the specific horrors each one of them was subjected to, is their intelligence, an incisive, sharp and carnal intelligence that rejects all pretense and false reasons-in a word-idealism." Lanzmann's films remarkably stay within the immediate present tense, where the absolute horror of the Shoah is always happening.